As we all know, whole grains are so important for a healthy lifestyle. They help reduce cholesterol, cancer, heart disease and diabetes. Steel cut oats are whole grains that are fully packed with many nutritional values. They are rich in proteins, fiber and vitamins. Coming to the recipe today: Upma is a staple breakfast in many households. It is usually made using semolina. 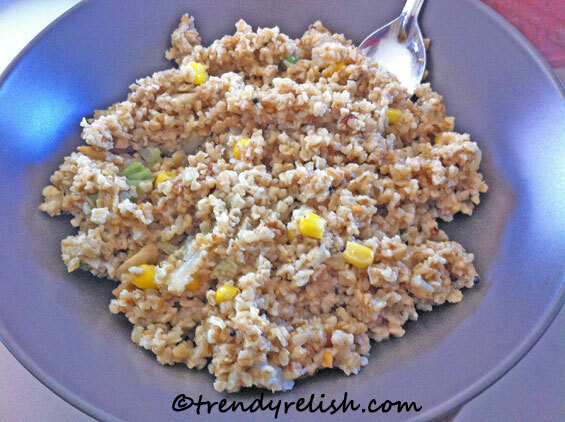 But these days there are many healthier options, where we can use whole grains like quinoa, oats etc. in place of semolina. Today's recipe is not only easy to prepare but loaded with tons of health and taste. I know the picture I posted for this recipe doesn't look that good. I was in a hurry when I was clicked the picture. I used my cell phone to click it. I will replace the picture with very good and clear picture soon. Heat 1 tbsp of oil in a large, deep skillet. Add mustard seeds. When they pop add urad dal + chana dal and curry leaves and roast well. Then add onion + green chillies + ginger. When onion becomes soft, add all the vegetables and sauté well. Then add water + salt to the vegetables and bring to a boil. Then add oats, and mix well. Cover and cook over a medium flame for some time. When the upma is done, the oats should become soft, but chewy. If the oats don't seem to be cooked well, pour some more water and mix well. Cover and cook again until the oats become soft. Enjoy the healthy and great tasting steel cut oats upma with desired chutney. I love how innovative you are in your use of grains, Uma. I always get great ideas when I visit your blog. Steel-cut oats sound perfect for upma! Very healthy upma. thanks for sharing !! Rather than the boring upma, this is better to have oats upma for it is good for health too with a high content of fiber for the body which is very helpful. I have ordered online oats from a supermarket online and will try if this makes me cook it again.